"And so, Father, we bring you these gifts. We ask you to make them holy by the power of your Spirit, that they may become the body and blood of your Son, our Lord Jesus Christ, at whose command we celebrate this Eucharist." (The Epiklesis, or the Invocation of the Holy Spirit). "When supper was ended, he took the cup. Again he gave you thanks and praise, gave the cup to his disciples, and said: Take this, all of you, and drink from it:this is the cup of my blood, the blood of the new and everlasting covenant. It will be shed for you and for all men so that sins may be forgiven. Do this in memory of me." (The Consecration of the wine). The altar is surrounded by the heavenly host of angels and saints, who also participate in the same responses we say at Mass - the Holy, Holy, Holy, for example, from Isaiah 6:3 and Revelation 4:8. And since we know for a fact that those in Heaven are one Spirit with Jesus Christ, from 1 Corinthians 6:17, we also know that our dear departed relatives who we miss so much are also present at every Mass we attend. How is all of this possible? Because Jesus is God, and he can do anything! The entire Old Testament points to this miracle, whether it's Melchizedek offering bread and wine as sacrifice with Abraham; the Jews having to eat the spotless Passover Lamb to be saved from death (NOT A SYMBOL OF ONE! ); the Jews being kept alive DAILY with supernatural bread from heaven in the desert, called manna (..."Give us this day our DAILY bread" from the Our Father prayer refers to the daily Mass/Eucharist); the changing of water into wine by Jesus at the wedding in Cana (a wedding is where 2 people become ONE FLESH! ); and the feeding of the crowd in the desert by Jesus multiplying the loaves. Some people erroneously believe that Catholics are sacrificing Jesus over and over again on the altar, which means that His one sacrifice wasn't quite good enough! But that is an error in their thinking. The Eucharistic sacrifice on every altar of every Catholic Church is done at the command of Jesus, in Luke 22:19, and it is the one and the same sacrifice RE-PRESENTED for us today through time and space (this is similar to a movie DVD re-presenting the same actors and the same words and the same scenes over and over again, even though it appears to be happening for the first time on your TV screen. The original set and the original acting are long gone, but they are re-presented for us today! ), and every day, so that we can be saved from satan, who loves it when we eat his forbidden fruit. The Eucharist overcomes satan's 2 lies to Adam and Eve- "Ye shall not die," and "Ye shall be as gods," he told them, if they would partake of the forbidden fruit. By consuming the fruit of the tree known as the cross, called the Eucharist, we shall live forever (John 6:54), and we become one flesh with God (John 6:56)! 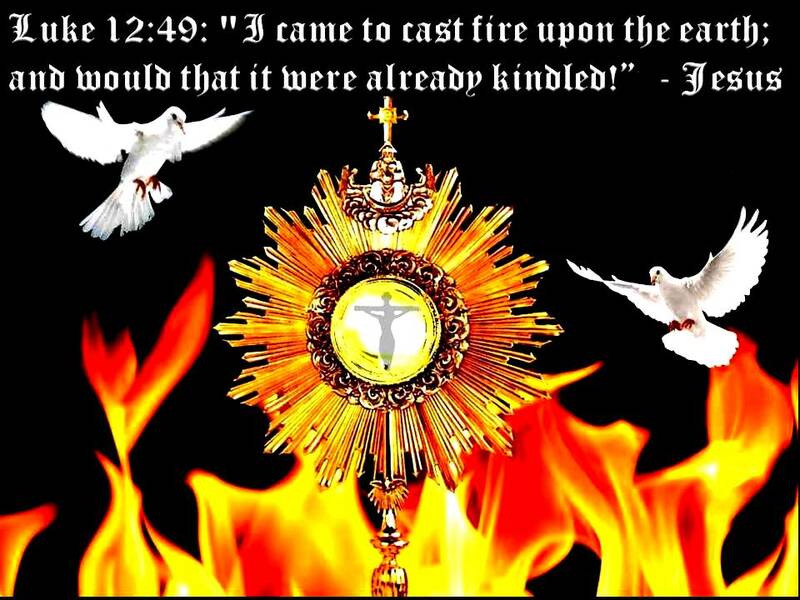 To deny that this can even happen is to deny the power of the Holy Spirit, the Love of God! John 6:  I am the bread of life. Many of his disciples left him over this, because they knew that he wasn't speaking metaphorically, but literally. We know from Mark 4:34 that Jesus explained all of His parables to His disciples, but yet here they are leaving him after this speech about the Eucharist. The only conclusion logical people can draw is that THIS IS NO PARABLE! And we have the words recorded from the successors to the apostles, like Ignatius, a martyr in the Colisseum of Rome who was taught by St. John the Apostle, which prove that Jesus wasn't talking in "symbolic" terms! We call this food Eucharist; and no one else is permitted to partake of it, except one who believes our teaching to be true and who has been washed in the washing which is for the remission of sins and for regeneration [Baptism], and is thereby living as Christ has enjoined. …He took from among creation that which is bread, and gave thanks, saying, "THIS IS MY BODY." 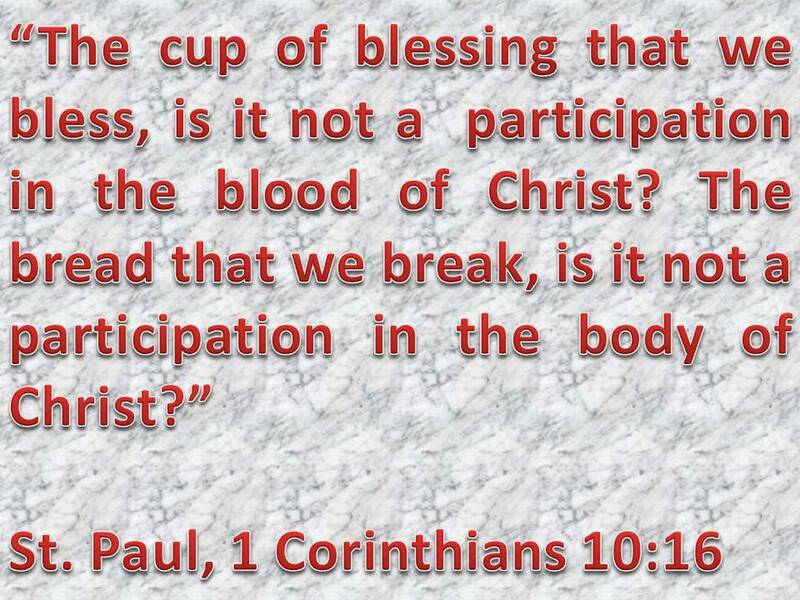 The cup likewise, which is from among the creation to which we belong, HE CONFESSED TO BE HIS BLOOD. If the BODY be not saved, then, in fact, neither did the Lord redeem us with His BLOOD; and neither is the cup of the EUCHARIST THE PARTAKING OF HIS BLOOD nor is the bread which we break THE PARTAKING OF HIS BODY…He has declared the cup, a part of creation, TO BE HIS OWN BLOOD, from which He causes our blood to flow; and the bread, a part of creation, HE HAS ESTABLISHED AS HIS OWN BODY, from which He gives increase to our bodies.